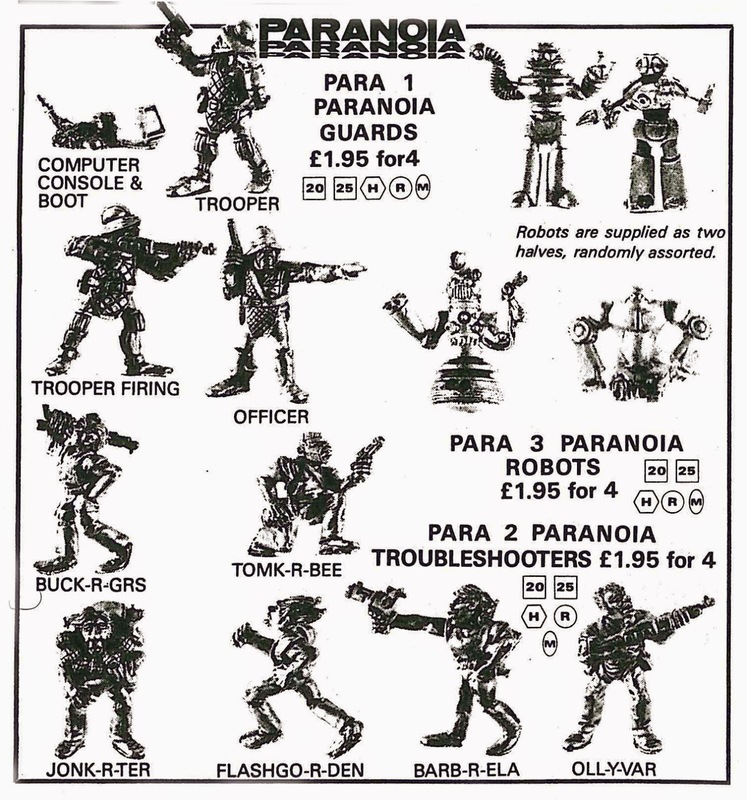 Since I've started collecting Citadel's Paranoia miniatures, I've realized how neglected these minis were in the 1980's and still are today. 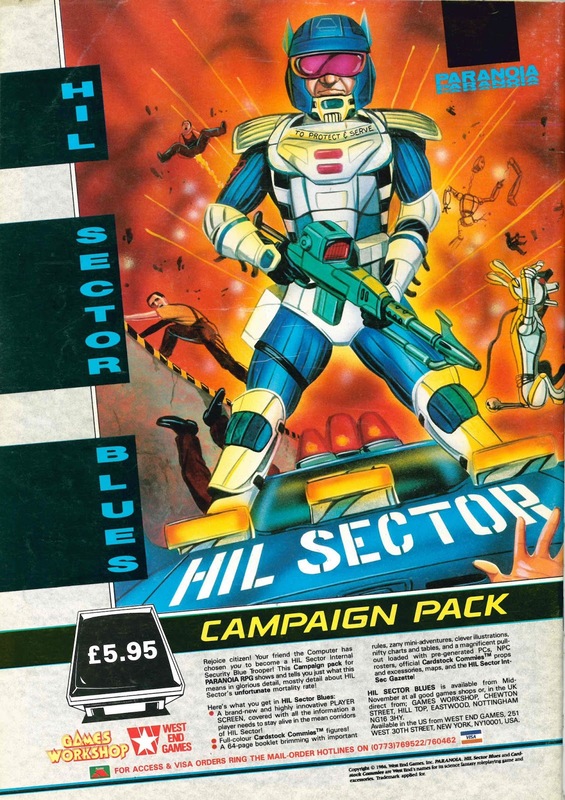 The range was introduced in 1986, coinciding with the release of HIL Sector Blues, a Paranoia supplement that included rules for using miniatures in the roleplaying game. However, pictures of the miniatures did not appear in the 1986 Spring Journal, the 1987 Spring Journal, Le Héraut Citadel 1986, or the compendious 1988 Catalogue. The low profile continues today: the page for Paranoia on the Stuff of Legends page is just a shell. As a result of this neglect, it's hard to tell what is and is not a Paranoia miniature. 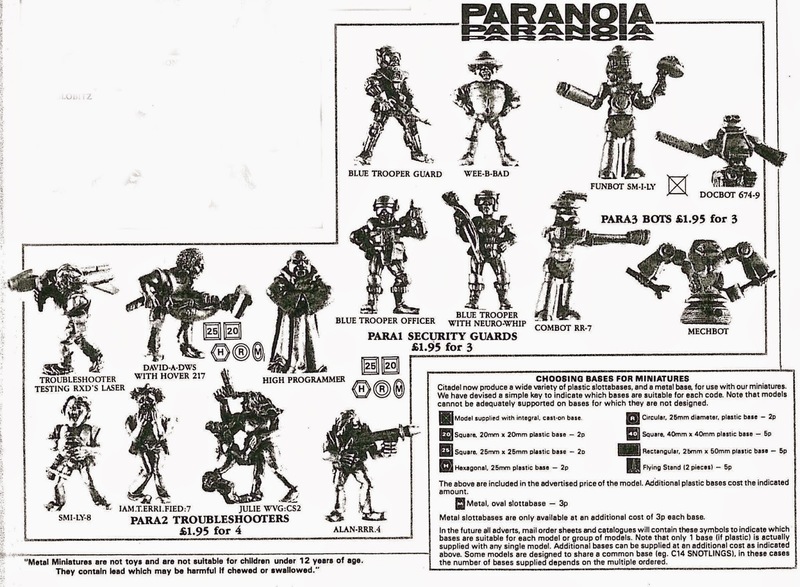 As I mentioned in my last post, Bobby Jackson sculpted some hilarious Paranoia figures for Mongoose Publishing in 2004 - they are slotta based and similar in scale to Citadel, so it is easy to confuse the two from a distance (As I did once on eBay). 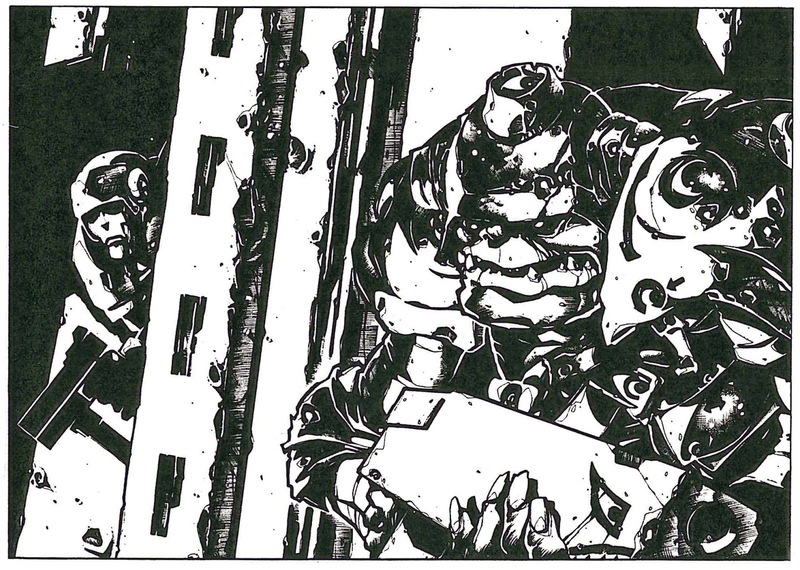 Before leaving Paranoia behind, I wanted to tip my hat to Goblin Lee and his excellent post about the funniest Warhammer 40K Rogue Trader scenarios ever written, Vulture Warriors from Dimension X Meet Plenty of Cheerful Orks with Plasma Cannon from White Dwarf 112 (April 1989). The scenario was written by Ken Rolston (who also authored HIL Sector Blues) and featured some illustrations by the fabulous Gary Harrod. 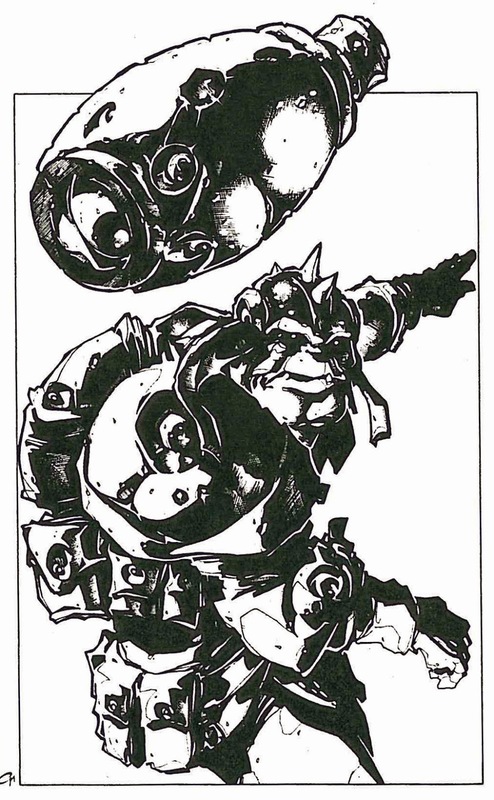 Although Games Workshop was already decadent and depraved by 1989, Vulture Warriors from Dimension X Meet Plenty of Cheerful Orks with Plasma Cannon is one of the last gasps of the classic Oldhammer spirit: a playful scenario requiring a Game Master and emphasizing simple DIY terrain and a spirit of role-play (In this sense, VWDXMPCOPC reminds me a lot of All the Nice Dwarves Luv a Sailor). The scene for VWDXMPCOPC reads like one of Shakespeare's dramas, although I can't remember which one: an expeditionary force of Troubleshooters from the world of Paranoia is instructed by the Computer to step through an experimental teleportation device, and they re-materialize in the Warhammer 40K universe. Unfortunately, the particular spot of the 40K universe they find is a small Space Ork outpost on an otherwise uninhabited Algae World. As you can imagine, fruitful intercultural communication ensues! The GM prevents the Orks and Troubleshooters from knowing what they're facing when they explore the outpost (which is meant to be represented by nothing fancier than three box lids supported by styrofoam cups). If you're looking for VWDXMPCOPC (and I don't know why you wouldn't), I've posted the entire article HERE so that you can relive the glory. Right you are, Chico! The CCM wiki is a service to the whole hobby. But I also like to be able to see the original documentation (or adverts) - which is why I also enjoy the Stuff of Legends (and why I posted these Paranoia ads). ALPHA – Alpha is a job to gather all kinds of new ideas at Aol. It permits individuals weblink to each other and the entire globe around them. ALTO – Alto allows adding all your e-mail records to app so you can see everything in one place including Googlemail, Viewpoint, Yahoo!, Aol E-mail, iCloud, and others.